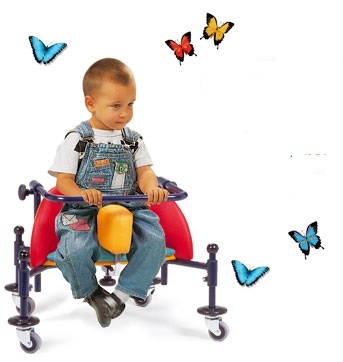 The frame of the sitting walking frame Birillo, of the company Ormesa is height-adjustable, made of steel painted with non-toxic epoxy paint. Seat: triangular to hold the pelvis (seat/back at a 90° angle). It is padded and wrap-around, upholstered with strong, washable plastic. Wheels: 80 mm fully-swiveling, rolling on ball-bearings, 2 with brakes. Many options for adjustable accessories.